Providers, payers, and state policymakers are moving to implement behavioral health integration (BHI) models as evidence of their effectiveness builds. BHI models bring together behavioral health and medical health providers to improve outcomes and enhance the efficiency of the delivery system. But many states face an obstacle—the lack of a health care workforce that has the legal authority, training, and skills necessary to practice in these new models. 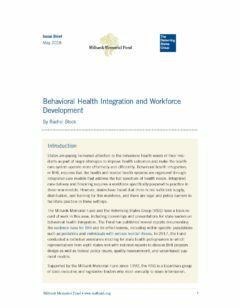 How can we accelerate the development of a BHI workforce? The Milbank Memorial Fund and the Reforming States Group (RSG) have a track record of work in this area. The Fund has published several reports on the topic. And the leadership of the RSG created a workgroup to focus on the issue. Supported by the Fund, the RSG is a bipartisan group of state executive and legislative leaders who meet annually to share information, develop professional networks, and commission joint projects. The issue brief, authored by Rachel Block, program officer at the Fund, focuses on several key areas of interest to policymakers: assessing workforce needs; identifying legal and policy barriers; and aligning resources. Three case studies illustrate how university-based research programs in Washington State, Nebraska, and Michigan are addressing BHI workforce needs. The brief is intended to assist state policymakers who are responsible for BHI policy in their states. It may also be helpful to academic research organizations that could apply these findings and resources in the context of their research, operations, or evaluation activities for states.